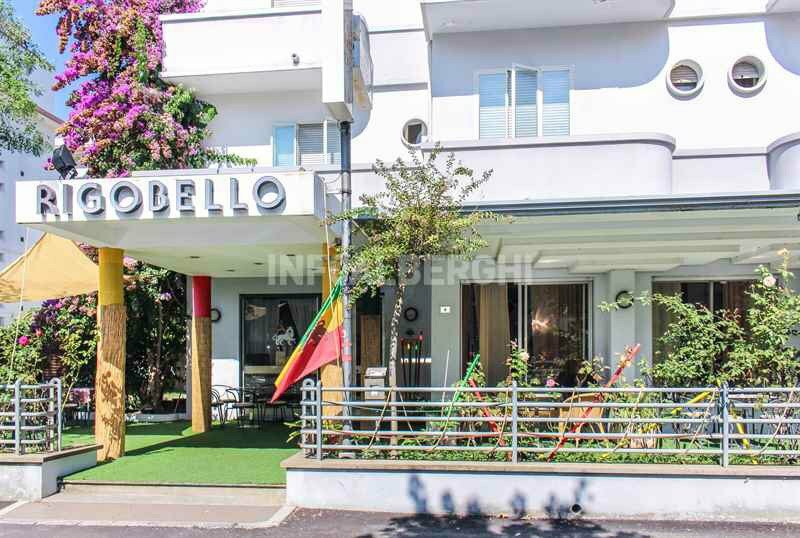 The Hotel Rigobello , a 3-star family run hotel, is located in Riccione just a short distance from the beach. Among the services offered: outdoor parking, free WI-FI and air conditioning. The hotel admits pets of all sizes. The hotel is located in a central area of Riccione near the beach, in a side street of Viale Dante. Viale Ceccarini is a 10-minute walk away, while the Oltremare and Aquafan parks can be reached in 10 minutes by car. All have air conditioning and heating, balcony, WI-FI, TV, telephone, safe, private bathroom with shower, hairdryer and complimentary toiletries. Rooms with a shower are available on request. Rooms are cleaned daily. FAMILIES: Family and connecting rooms are available for groups and families. Equipped garden, free bicycles, bar, reading room, TV lounge, lift, 24-hour reception and luggage storage. Late check out service is available on request. The property is equipped for cyclists and organizes theme nights. PARKING: uncovered and free parking spaces, available subject to availability. AIR CONDITIONING : free and available throughout the entire hotel. CONVENTIONS: beach, amusement parks, spas, discotheques, restaurant, organized excursions, swimming pool and waterslide. LUNCH AND DINNER: offers a home-made cooking with 3 menus to choose meat and fish every day, vegetable buffet, appetizers and desserts. For those who choose the All Inclusive formula, drinks are always included. VARIATIONS: vegetarian and vegan menus are prepared on request. OTHER: every week a thematic evening is organized with tasting of Ethiopian cuisine. In hotel: outdoor and indoor playground area, bottle warmer, pediatric service and baby sitting. At meals: dedicated menus, baby food at the table.